The Rio Alto /RIO.to) (RIOM) /Sulliden (SUE.to) deal: What's "New Rio" worth? That's exactly and precisely the question we'll be tackling in The IKN Weekly, edition number 266, out this weekend. Though one thing's for sure: Even at current gold prices it's worth a whole bunch more than CAD$2.20. 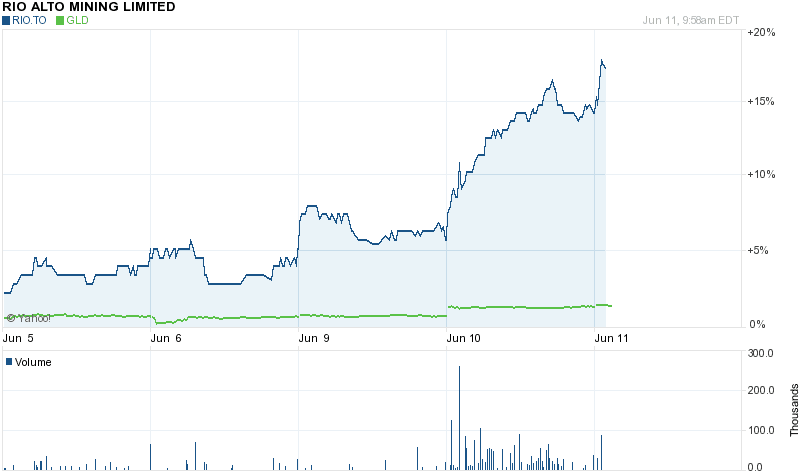 It's now 25% up since....errr...last Wednesday's news. You know, what with the downturn in metals prices and its ever increasing imports, you might even think that the country is starting to....oh forget it. One more thing to say about the Brazil 2014 World Cup before it starts, then IKN will leave you in peace to enjoy the wonderful football and the 90% finished stadiums. 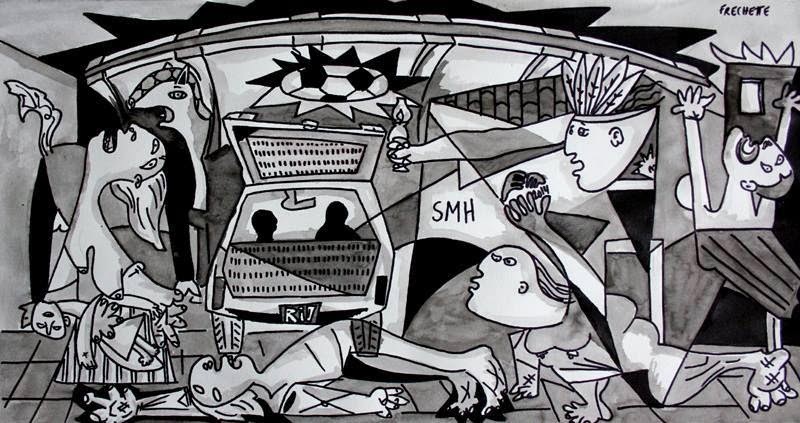 This re-working of Picasso's famous canvas by Rio artist Alex Frechette is the best protest against the FIFA bunfest so far. The last four or five seven or eight* posts (today and yesterday evening) over at My Own Market Narrative are all good stuff. You have gold commentary, you have market commentary, you have Iwnattos ripping it out of Business Insider and Casey Research. Recommended brainfood and entertaining to boot. Right here. By the way, I've read his report today and it's a good argument in my personal opinion. However, I have no position either side of PRB.v, purely sidelines watching and will stay that way. I'm sorry, did I say 12%? Disclosure: Yeah I'm pumping a big long holding of mine. So what? Bite me. ....on your hard work this week. The way in which you dedicated your time and efforts into to exercising 200,000 options of Sandstorm Gold (SSL.to) (SAND) and then managed to sell them all into the market, quietly and piecemeal and all that. IKN can't be bothered to work out the exact net profit* but around $650,000 looks close. That right? Anyway, beats doing anything about Santa Ana and we're sure glad that there are still people out there who are making a fat profit in this crappy market. An example to us all, Andrew. *Before taxes, of course. Mr. Swarthout will pay his taxes. Oh yes. I'm spending more time thinking about copper than just about anything else. 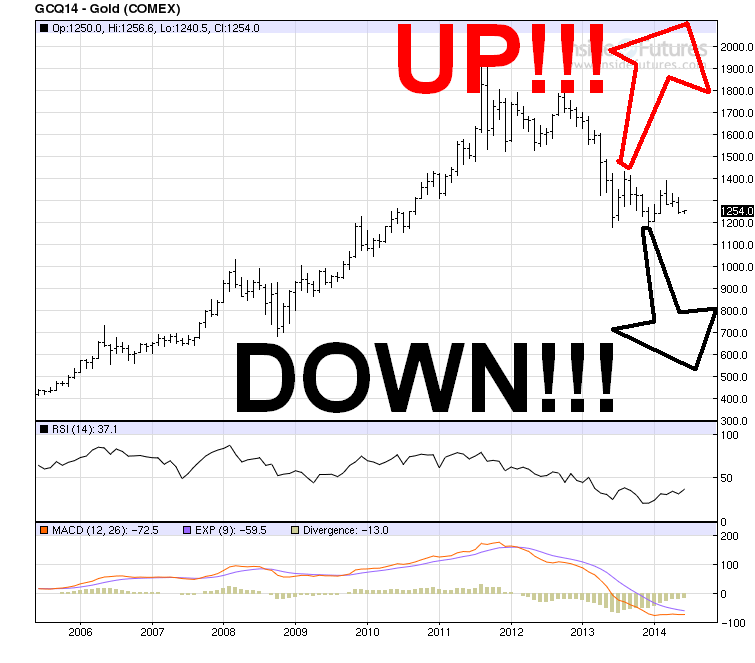 Gold's a sideshow right now, a noise in the background. 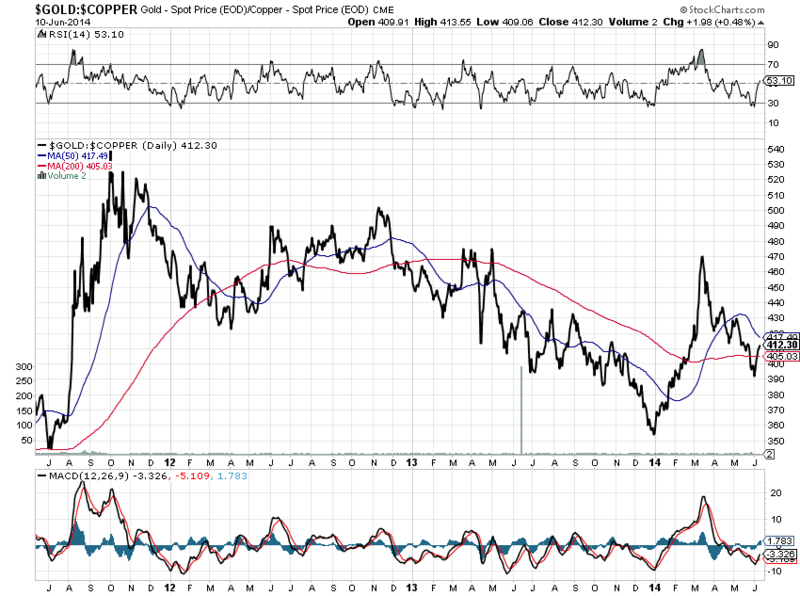 Copper's where there's real money to be made this year. Rio Alto (RIOM) (RIO.to): Did something happen last Wednesday that changed the market's attitude to its takeover of Sulliden Gold (SUE.to)? Good Wednesday morning, this should get out just before the open, though the internet connection here is poor today so let's see how things go when i hit the send button. By way of a very quick resume, on Monday i spent two hours with the RIO.to CEO and COO in Lima. Then unbeknown to them and anyone else, got on a plane and a couple of buses for an uninvited site trip to Cajabamba, in the Cajamarca region of Peru, to check out the Sulliden project for myself as well as discuss the project with politicos in town. I'm still in Cajabamba this morning and one meeting left in town this morning before heading out, but it's very unlikely indeed to change today's call. I've met the people i wanted to meet in Cajabmaba and i've seen 98% of the things to see at Shahuindo without being invited on site (a near-arrest stopped me from seeing the last 2%, i'll tell you about that Sunday, all good fun though). You'll get a full report and photoshow in Sunday's edition of the Weekly, but the bottom line is that Shahuindo is in a much better political and community risk position than i'd previously assumed. I was wrong about this project and it's taken the takeover situation for me to shake down my assumptions, but now that i have and i've seen and heard the situation here, this project is one that's going to happen. A little humility is positive for the soul....and in this case the stock call too. As a consequence, RIO.to is reinstated as a Top Pick stock however, those of you looking for a quick flip gain have to be clear that the offer situation between RIO.to and SUE.to means that the stock is likely to flatline until the deal is closed. We may get fluctuations as a function of gold price etc in the meantime, but anyone looking to buy "New RIO" has a couple of months of time to position themselves, i'd say. Personally I'm not adding any more at this time, as i have a lot already. By the way, that report and photoshow happened in IKN265, out last Sunday. By the looks of the mail feedback received from subscribers, they liked it. That's good, too. UPDATE post bell: I'm sorry, did I say 8%? I meant 12%. Lord knows why the thing decided to rally today, really don't have a clue as to.....ohhh, forget it. We use the close for the gold ETF (GLD) to follow the price of gold bullion (it's a very accurate proxy for ratio purposes and it's easy). As of yesterday, the ratio has moved up to 5.43X, that's up from the low of 3.18X two months ago. That's a pretty decent move. Yup, it's another day in which we pretend to care about utterly insignificant movements in the price of gold. This kinetic sculpture consists of 81 erectable penises that respond to either a viewer's movements or to realtime movements in the stock market. 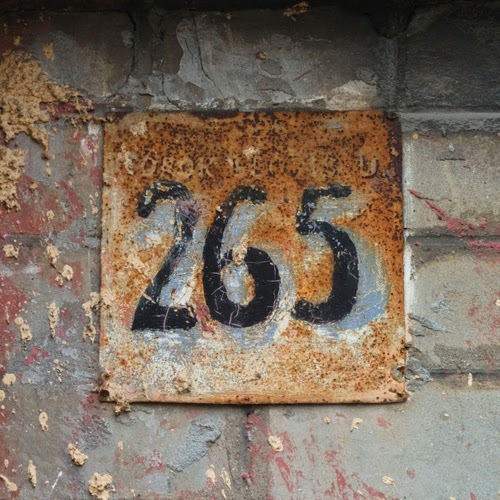 IKN265 has just been sent to subscribers. It main feature is a report on a site visit with a difference. Your author visited the Shahuindo Gold (SUE.to) project in Cajamarca province to see what there was to see, but the small detail was that he wasn't invited. So right up to the point where he was kicked off and nearly arrested things went well...and after that, they got even better. PS: And this is Serge Gainsbourg and Brigitte Bardot singing Bonnie and Clyde, a song created in a way so far ahead of its time it's frightening. "When you get frustrated because something isn’t the way you thought, examine your thinking, not just the thing that frustrates you. And you will see that a lot of your suffering is created by your models about how the Universe ought to be. And your inability to allow it to be. If I meet somebody that is a liar and a cheat, they are like an elm tree. They are the essence of lying and cheating. If I have a model people shouldn’t lie and cheat, then I am immediately in opposition to that person. I don’t have to play games with them. I may say “In the future, you and I can’t play together, because you are a liar and a cheat and I can’t play with you” but I at least appreciate and allow them their lyingness and cheatingness. That’s their problem, not mine. My problem was my expectations. If you have a model that everybody is good and then somebody isn’t, then you end up hating the world and being all upset about the world because it isn’t the way you expected it to be. It’s like you come here and it’s a beautiful day, so you expect the next day is going to be beautiful. Then it rains, and you are disappointed. Isn’t it funny that when it rains, you should be disappointed? To take nature and allow nature, when it’s in its natural state, to make you miserable. It says something about you. It’s like decaying and dying. If you are upset about decaying and dying, you’ve got a problem. You really do." On this link is a two and a half minute video report that's a follow-up to yesterday's note on the conflict between locals and Peruvian mega-mines, with Antamina as the focal point. Check out the dust cloud that rises from the mine, really rams home the problem. The video can't be embedded. so go over and watch it on the link.